The Pacific walrus relies on Arctic sea ice throughout the year for breeding, nursing calves, traveling and resting between dives for food. 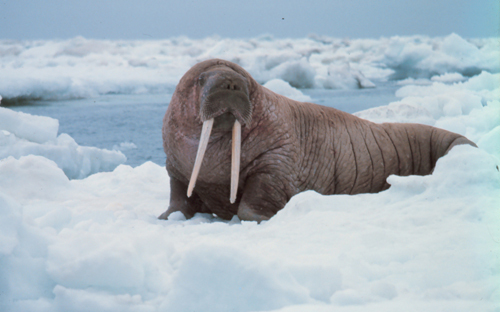 The rapid loss of sea ice due to global warming greatly threatens the survival of the Pacific walrus. Arctic summer sea ice is predicted to disappear completely by 2030 or before, and 40 percent of winter sea ice in the Bering Sea may be lost by mid-century if current greenhouse gas emissions continue. Restricted feeding – Females and young walruses rely on summer sea ice as a safe haven for resting between dives for clams and mussels in the shallow waters of the Chukchi Sea where their food is abundant. As global warming causes summer ice to retreat farther and farther north, walrus moms and calves are left without sea-ice resting platforms over their feeding grounds, forcing them to abandon their foraging areas and haul out on shore. On-shore risks – The disappearing ice causes walruses to concentrate in abnormally large numbers on shorelines in summer when females and young walruses are forced to come to land. On shorelines, which are typically used only by male walruses, young walruses face significant threats from predators, human disturbance, and being trampled by other walruses. When spooked by a polar bear or human, walruses will stampede for the water and large, male walruses can easily crush smaller walruses. In 2007, 3,000 to 4,000 walrus, mostly calves, were trampled to death along the Chukotka, Russia coast alone. In addition, Pacific walruses face growing threats from ocean acidification, which threatens to reduce their food supply, and oil and gas development which heightens the risk of oil spills and increases industrial noise pollution and harassment from ships and aircraft.